Exciting new details emerge for Anthem at The Game Awards 2018. During The Game Awards 2018, a new trailer for Anthem was revealed which included a plethora of new story details. In the trailer, the “Anthem of Creation” is shown and described as both a source of destruction and a source of creation. Essentially, a great power that can be harnessed for good or evil. Then, the Freelancers are shown as guardians for the remaining colonies of the world kept safe behind walls. One of the main settlements is Fort Tarsus which is engaged in a war against another settlement called Dominion. Monitor, the leader of Dominion, has harnessed one of the main artifacts from the Anthem of Creation. 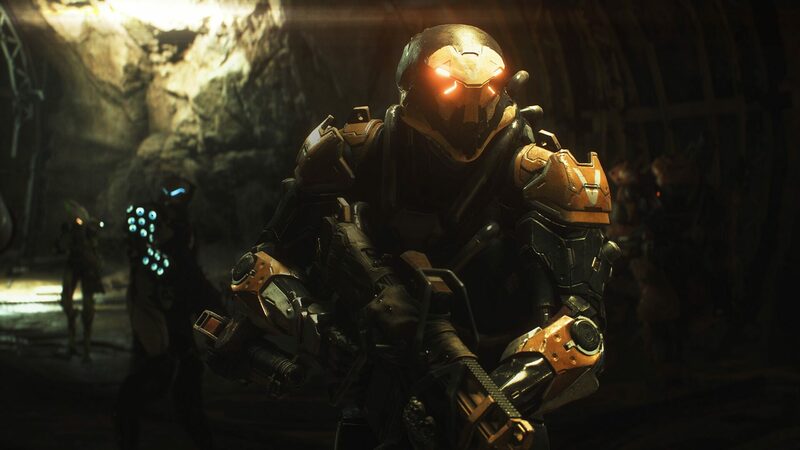 Depicted as one of the game’s main antagonists, Monitor looks like he’ll be quite a challenge to handle once Anthem is released in 2019. New details for Anthem were revealed at The Game Awards 2018. Meanwhile, other characters were given some time in the spotlight. Below, we’ve listed each of these characters with info courtesy of Shacknews! Haluk: A Freelancer who pilots an airborne base called the Strider. Originally from the Mirelands, players start Anthem with a bit of backstory on Haluk to set the tone for the rest of the game. Faye: A former Cipher, Faye has been trained to use the Amplifier that harnesses Anthem power to broadcast signals. Essentially, Ciphers guide missions. Unfortunately, Faye no longer serves as your Cipher for reasons later explained in Anthem’s story. Owen: Owen is your current Cipher. Agent Tassyn: An Agent of Corvus, Tassyn handles the intelligent organization with access to Javelins and gives the player one at the beginning of Anthem. Sentinel Brin: As peace officers, Sentinels have their own Javelins. You’ll be in contact with Brin throughout Anthem as she’s the one who doles out side quests. You can watch the new trailer for Anthem shown at The Game Awards 2018 down below. Right now, Anthem is scheduled to release on PlayStation 4, Xbox One, and PC on February 22. After watching the new trailer, what do you think of Anthem? Do you plan on playing it when it comes out next year? Let us know down in the comments below!